This coming Saturday, 23 March 2013, Singapore will be celebrating Earth Hour. *WEATHER PERMITTING*, there will be free public stargazing at a few locations in Singapore. Please check with the individual organisation for the latest updates of their events. Thanks to astronomy.sg for providing some of the info. - Organised by Woodlands Community Club. - Stargazing from 7:00pm. Park lights to be switched off after 8:30pm! My friends and I will be conducting free stargazing sessions at Bishan - Ang Mo Kio Park from 7:30pm onwards. Location is just outside McDonald's at the park. As of now, there is no news of this park switching off its lights during the event. If you are organising a stargazing event this saturday and would like to be listed here, please feel free to send me an email at gary@astro.sg. - The switching off at 8:30pm is NOT compulsory by any law. Only some participating organisations are supporting it. So do not expect the whole country to be in total darkness and be able to see the Milky Way stretching across the sky on Saturday. 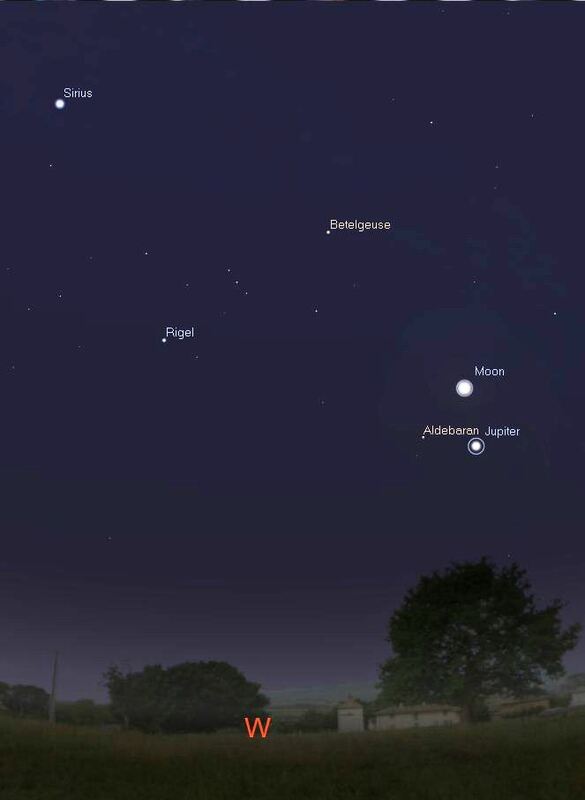 - In addition to Jupiter, Moon and star clusters, do give Saturn a try tomorrow night! It rises at around 9:35pm from the horizon. The longer you can wait for it to rise higher, the better the view will be. - For viewing of Planets, Moon and bright star clusters, you do not really need to go to a very dark location in Singapore. Thus, you may organise your own private Earth Hour stargazing sessions with family and friends in a relatively bright but more convenient place. Perhaps at someone's house and switch off all the lights for an hour (or longer) from 8:30pm. Going to a darker outdoor location does have the advantage of lesser local light pollution which means lesser eye irritation of direct light shining at you or the telescopes. It can also enhance the of stargazing atmosphere and mood. But visually, do not expect to see a lot of extra details for bright objects with the same astronomical equipment just because you are stargazing at a darker site in mainland Singapore. For example, you will not see an extra bigger Jupiter or surface details of its moon with the same amateur-size telescope. So lets all pray for clear skies tomorrow and wishing all of you a wonderful Earth Hour stargazing session wherever you are! There is a free public stargazing talk this coming Monday. Admission is FREE. No pre-registration required. Latecomers are welcomed too! You will also learn how to read simple star charts and understand basic astronomical concepts. *Weather permitting*, we may be conducting a live stargazing session at the open space outside the Toa Payoh Library. 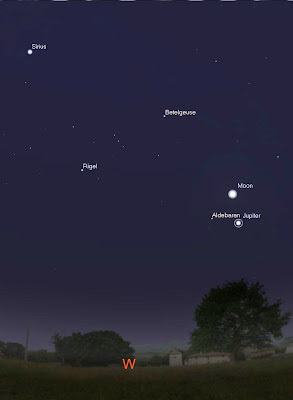 On that evening, a beautiful first quarter Moon, Jupiter and Aldebaran will form an interesting triangle in the western sky! You can enjoy the celestial wonders through our telescopes and even take photos of the Moon with your mobile phone through them. So please bring your family and friends along and enjoy an entertaining evening at Toa Payoh Public Library this coming Monday. See you there! Comet C/2011 L4 (PanSTARRS) will be at its brightest today 10 March 2013 shortly after sunset. This comet is potentially visible in Singapore BUT it will be very challenging to observe because it is very near the horizon (5 degrees away) and will disappear below the horizon at about 8:18pm. You need to have an unobstructed view of the west and clear skies to even stand a chance of seeing it here. So if you intend to catch it, enjoy it as a challenge and do NOT have too high expectation of how it will look like. The bright and long-tail comet images you see online of PanSTARRS are mostly taken with long-exposure photography techniques and at good locations in the world. To increase you chances, try to go as high up as possible which has a good Western view - e.g. hill tops, tall buildings, roof top gardens, multi-storey carparks, etc. Do take note of your own safety at such heights. You may also try long-exposure photography of that area and may stand a chance to catch it in your photos though visually your eyes may not see it in the sky. Some of my friends did that yesterday successfully! Instrument wise, try to use a pair of binocular or better still a telescope. For telescope, if you have a choice, try to use one that has a big primary mirror/lens and still capable of giving wide and relatively low magnification. You do not wish to over magnify the comet as it may render this already dim object even dimmer. Using a binocular is always better than not using any optical instrument at all. WARNING: Do NOT look at the setting Sun directly with or without optic instrument. It can cause permanent damage to your eyes. Proper viewing of the Sun requires certified special solar filters and astronomers who know how to operate solar telescopes safely. This is where you should look at from about 7:55pm when the sky is about to get dark -- 265 degrees (West). Use an accurate compass to find this direction. Will be great if there are distant background objects near this degree which can then be used a visual marker to scan up and down the sky for the comet. This comet will appear about 5 degrees above horizon - about the 4 fingers width held at your arms length. With every passing minute, it will "move" nearer and nearer to the horizon until it is completely blocked below the horizon at about 8:18pm. Thus, you must try to aim to find/photograph this comet as early as possible. With every passing minute, your chances of seeing it will decrease because in addition to potential clouds, the atmospheric distortion of light will be very high near the horizon. We should be still be able to see this comet in the next couple of days after the sunset if the sky is clear. But today is still the best chance as it is potentially the brightest. There is a bigger, brighter and easier-to-spot comet appearing in our skies in November this year - Comet ISON. Assuming it doesn't break up, it should be a spectacular sight! So regardless of your outcome of trying to observe Comet PanSTARRS, you may gain some useful experience for spotting Comet ISON. This is a once-in-a-lifetime event. Nobody alive today will see this comet again. Wishing all of you good luck and clear skies!